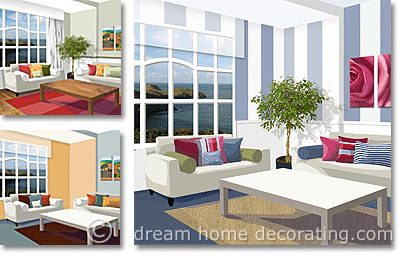 Build interior design colors from scratch, in any room. Wondering how to pick the right wall colors? The article about Choosing Paint Color may be right for you. Looking for color scheme examples? Visit the pages about Great Color Combinations or Room Color Schemes, for more choice! This page details the logical, step-by-step process of developing room color schemes 'from the bottom up'. Does this room get a lot of sunlight? Or does it feel dark/cool/chilly, and in need of warming interior design colors and materials? 2. Which colors are in the room right now? Which of the room colors can not be changed? => These will automatically become part of the interior design color scheme of this room. Are there any unwelcome or distracting colors that would need to be hidden/covered/overpainted? What is the most budget-friendly way of doing this? Whether you're choosing interior design color schemes for yourself or for a client, your choices will be limited by the money available for this project. Money no object? Proceed to Step 3! A cool, contemporary Mediterranean theme like this would be great in a sunbaked environment, but for a northeast facing room in Western Europe ... it's not entirely convincing! The painted concrete flooring with handpainted ceramic tiles in the middle, and the aluminum window have a distinctly icy feel. So we'll be looking for warmer, more comforting interior design colors and materials. 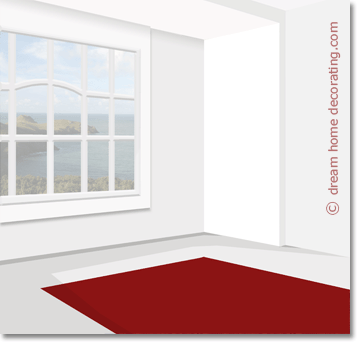 Replacing the window frame with a wooden one, putting down floorboards or installing wall-to-wall carpet is not cheap. So how could you 'neutralize' the current room color scheme and develop new interior color combinations without spending a fortune? Paint the concrete in your color of choice and cover the tiles with a rug. Come what may, these items will be part of your set of interior design colors for this room. But all by themselves they may not provide you with exciting choices for great color combinations. The most conspicuous item (e.g. large-scale wall art, a fabulous rug, a textile in striking patterns, or accessories in great color combinations). 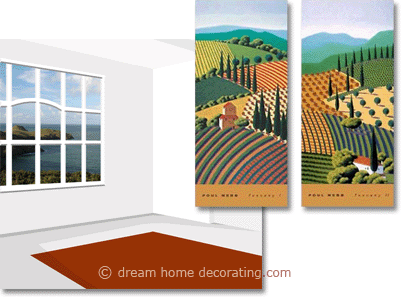 We'll use these two Tuscan prints to inspire a color decorating theme for the room. The colors go well with the view from the window - similar greens and blues - but the painting also adds warmer room decorating colors through the underlying earth tone color scheme. So in essence, we're going to create a red-green complementary color scheme, with a supporting cast of neutrals. Having settled on our interior design colors, how are we going to distribute them in the room? The potted tree adds even more texture and a soothing natural hue to the interior design colors of the left room. Looking at the two rooms above, you can see that the 60-30-10 color ratio sort of applies, but that it has nothing to do with color dominance. In the right picture, the walls are mostly a neutral white, but it's the red and orange colors that actually dominate the room. The red dominates even more in the left picture; the sage green upper walls are almost necessary to 'cool down' the impact of the rug. In other words, the 60-30-10 'rule' is nice to keep in mind, but much more importantly, you want to pay attention to how colors interact in interior design color schemes. is a good rule of thumb - and as before, I'd say apply with a healthy dose of anarchy! Let's assume you like experimenting & updating your home decorating color schemes every so often. Unless you plan to replace your more expensive items (e.g. couch/upholstery, cupboards, cabinets) along with your wall color combinations, you'll need decorating staples that will easily play along with your color experiments. Why buy big-ticket items in Neutrals? seamlessly blend in with more up-to-the-minute decorating ideas. Classics in neutrals are likely to stay with you for a long time - longer than your current wall color combinations, window treatments, or wall art. Having some timeless, quality furniture in neutral colors allows you to change all the low-cost items around it - thus creating a new room color mood - whenever you feel like a change of scene. Same sofas, same basic color combination, but by giving the 60% share to neutral colors, you have created a much calmer, cooler room color mood. we brought in a fresh straw rug. For about $200, the room's as good as new! Why leave choosing interior paint colors until last? Because it's easier to find wall color combinations that go with your decorating textiles and your furniture, than the other way round. There simply are more colors to paint a room, than fabrics to dress a window, or carpets, or decorating accessories. Because changing interior wall colors is comparatively inexpensive. If your first paint color ideas don't look right, you can always repaint. No big deal. Interior paint color combinations sometimes look great on small color swatches, but very disappointing once they're on your walls. Choosing paint color slowly and deliberately is really important. Always test your interior design colors thoroughly in different areas of the room and under different lighting conditions! Neutral color palettes make great interior design colors, but they're not as straightforward as many people think. Understand what makes neutral color schemes look their best, and what happens when you mix neutral color palettes with more saturate interior design colors. It's FREE!! Return from Interior Design Colors to Room Color Schemes.